This is Fearne’s autobiography. He suffers from schizophrenia. But to begin, the book starts in-utero, where Fearne encountered his first trauma at the hands of curette. The book then delves into Fearne’s formative years. It then traverses Fearne’s interest in Buddhism, and the writing of his text, Diary of a Schizophrenic. Diary of a Schizophrenic, picked up by Chipmuka, was to be launched at the 2010 Melbourne Writers Festival. Fearne was to be interviewed on Radio National around the country. Fearne completed his BA at Melbourne University, and there he also completed a masters in the philosophy of art. He also a completed a PhD at LaTrobe University on schizophrenia. Fearne’s own schizophrenia was well managed through these years. Fearne’s second book, A Schizophrenic on Artaud, was launched at Readings in Carlton. Fearne appeared on ABC News 24 TV as part of the Emerging Writers Festival. He appeared regularly on the Brainwaves radio show on community radio, and had his own show. He initially volunteered for mental health NGO’s, but then found work in the field. The book is one of hope, and one of sadness. There are times when Fearne’s life is falling apart, but times where he is achieving some amazing things. It is all recounted with a touch of humour. Fearne suffers from schizophrenia. But this hasn’t stopped him. He has a PhD on schizophrenia from LaTrobe University. His first book was launched at the 2010 Melbourne Writers Festival, and he was interviewed on Radio National. His second book was launched at Readings in Carlton, and he got on ABC News 24 TV. He has had his own radio show. He has worked in the field of Mental Health. Fearne is now medicated and enjoying life. He has seen both sides of life with high functioning mental illness, and has been hospitalised in his past. Fearne responds well to medication, and is now in a good spot to tackle life’s challenges. Fearne was born in 1975. It is of value to outline where this story ends, before we begin the sometimes fraught details of a life lived with schizophrenia. There is much in this book that is positive, and some grand adventures were had. But in amongst this, there is suffering. It doesn’t dominate the book, but there is enough to keep us on our toes. This is a book with a happy ending, one that I hope will up lift. The suffering is measured by the good times in many respects. I have lived life to its utmost limits, and have known the depths as the heights. But the adventure continues for me, and I never know which way life will turn. But let us get to the good bits. I suffer from schizophrenia – tick. But I also have a PhD, and it is even on schizophrenia. I also have a master’s degree in the philosophy of art. Strange bedfellows, but that has been my life. My PhD was at LaTrobe University, and my masters was at Melbourne University. I have had a number of books published. My first, Diary of a Schizophrenic, was published by a London publisher. It was launched at the 2010 Melbourne Writers Festival. It is a record of my first psychotic episode in 1998. During the time of the launch I was interviewed on Radio National’s show, ‘All in the Mind’, hosted by Natasha Mitchell. We covered my book, my PhD, and my life with schizophrenia. At that time, I had everything a person could want. I had a writing career. I had a beautiful wife, who was a successful poet. I had a new healthy son. I lived in a relatively exclusive suburb. I had a nice car, my family were alive and well, and I had great cat, just to top things of. As I was to learn, this was hubris, and the gods wouldn’t stand for it. But more of this later. That’s right, happy, positive. Around the time of my book launch, my poetic career took off, and my poetry became widely published. I also had a few academic articles published on schizophrenia. My second book came out, and was on a French poet who suffered from schizophrenia, known as Antonin Artaud. I was doing some publicity for the book, and participated in some panels for the Emerging Writers Festival. One of my panels was on ‘Tough Topics’. The ABC were there filming, and I got on ABC News 24, on the show ‘Big Ideas’. The other panellists must have been very disappointed, because when the ABC broadcast the panel discussion, it was just of me! Lucky I am a narcissist! After my first book launch, I started volunteering for a number of Mental Health NGO’s. I volunteered for the Mental Illness Fellowship of Victoria on their helpline. This was difficult work, but very rewarding. I also volunteered for Mind Australia in their PALS program, providing a point of social contact for sufferers of mental illness. I would drive to my clients house, and have a coffee with him. We would chat, drink coffee, listen to the radio, watch some TV, and have the occasional outing, such as to the zoo, where he asked to go. My volunteering paid off, and I got paid work as a facilitator for the Mental Illness Fellowship of Victoria, conducting workshops for the roll out of the National Disability Insurance Scheme. And then it really paid off, when I got full-time work for Mission Australia in their PHaMs program, standing for Personal Helpers and Mentors. We helped sufferers to find employment. I was perfect, because only 5 months before getting the job, I had been hospitalised for my condition, and briefly made an involuntary patient. So I just knew how to get a job while being unwell! 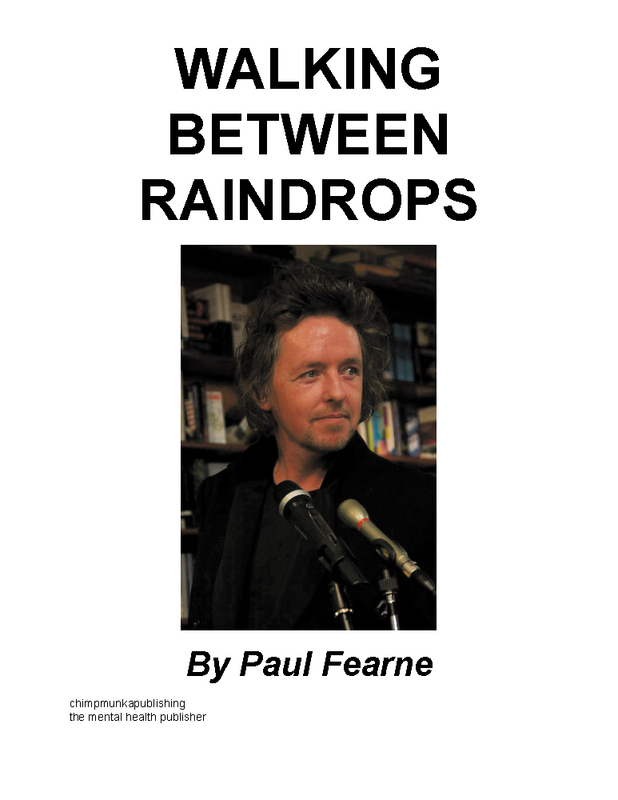 I have called the book ‘Walking Between Raindrops’, because it seems an impossibility, but fun to try. So now, you must read on!